From heating and hot water to Auto gas for company vehicles, Diversified Energy provides a wide range of commercial propane services that help businesses operate cleanly and more efficiently. According to the Department of Energy, as of 2009 more than 48 million households utilize propane for heating and cooking as well as a backup source of power. This widespread use is translating into a growing number of businesses realizing the cost-effective and environmental-friendly benefits of propane as an energy source. Propane is a smart choice for operating large stoves and fryers as well as refrigeration units, heating water in commercial-sized water heaters, providing heat for office space and warehouses, and supplying power to greenhouses. And these are just a few examples of the ways in which propane services a wide variety of commercial customers. The National Propane Gas Association states that industrial uses for propane range from soldering and cutting to brazing and vulcanizing. Propane is also used in the manufacture of plastics by some petrochemical industries. Farm use for propane includes crop drying and fruit ripening as well as a means to provide heat to barns and chicken houses. Diversified Energy stands ready to supply the propane you will need for any of these types of commercial settings. When it comes to its commercial clients, Diversified Energy provides all of the timely and friendly propane services that make it so popular with thousands of homeowners who enjoy the use of propane for everything from outdoor grilling to indoor heating. We are proud of the services we offer many restaurants in a growing area covering Eastern and Central North Carolina and Southeast Pennsylvania. 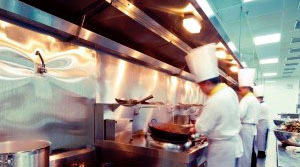 We work with both national chains and privately owned establishments to provide propane gas as an energy source for grills, fryers, commercial cook tops and ovens, warmers, and large refrigeration units. We provide a 24-hour emergency service to restaurant owners so they can rest assured that their business will not be down for any length of time due to a propane gas system or equipment malfunction. 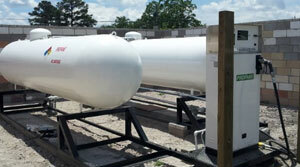 We also perform the installation of gas piping and storage tanks in the area of industrial processing. 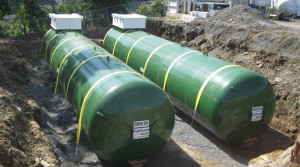 Our storage tank sizes range from 1,000 to 30,000 gallons, which means we can work with even the largest customers who have significant propane gas demand. Delivery options include full transport Direct Ship and Metered Services — whichever works best for you. Our 24-hour emergency service also extends to industrial businesses. When hotels and retirement homes need a sufficient supply of hot water, and energy for clothes drying, commercial kitchen and central heating, they often turn to the use of propane to get the job done. Diversified Energy provides tank installation, gas piping installation and other equipment needed for those businesses that are looking for propane as a source of heating water and office or warehouse space. 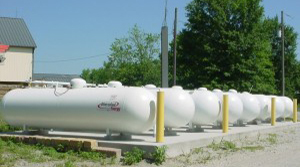 We provide volume pricing and propane delivery that you can count on! We expect to see ample growth in one area of propane use for commercial customers: propane auto gas. Propane auto gas is already being utilized for many school buses and shuttles, and more and more businesses are turning to commercial vehicle fleets that are powered by this versatile fuel. Propane auto gas is also a popular choice for powering forklifts in many warehouses and Diversified Energy offers the choice of delivering propane cylinders or in bulk so that businesses can keep their important equipment moving. What’s more, we don’t just talk the talk, we walk the walk — one-third of our delivery trucks run on propane auto gas. Are you ready to make the change? Diversified Energy can even help you convert your present fleet and even set up refueling stations on site. How’s that for service? When it comes to commercial propane use, you need a pro for the job. You need Diversified Energy. Learn more about the commercial uses of propane and how you can implement the use of this green energy source in your business and contact Diversified Energy.